The Quicksteps will begin their 2017 season in the coming weeks. This has been an offseason of hard work, developing ideas, looking for new talent and attempting to find better ways of participating in the Minnesota Vintage Base Ball experience. It has also been an offseason in which the schedule has been changed and adapted. So, our season schedule may look just a little different than players might remember it from when they signed up at the Annual Hot Stove League dinner and meeting at Rufus Nelson’s home. The Quicksteps are still committed to fielding a women’s team this season, but it looks like there will be two matches this season instead of three. Watch this site for further updates. The Quicksteps are using their Facebook page more than in the past. Partly to advertise events in the future, but also as a way of keeping in touch with players. So, keep your eye on the Quicksteps BBC Facebook page and the Lady Quicksteps Team Members Facebook page for information about matches, practices and players. The Quicksteps 2016 season has come to an end. Manager Ernst wishes to thank everyone who participated as players. He also wishes to thank Men’s Captain, Rich Arpi and Ladies Captain, Rosie Dotson for their efforts to utilize the players in the best possible manner. Recruiter Rufus Nelson continues to find individuals who are willing to learn, play and exhibit our game in the most dignified, gentlemanly and lady-like manner. He also wishes to thank Men’s Captain, Rich Arpi and Ladies Captain, Rosie Dotson for their efforts to utilize the players in the best possible manner. Recruiter Rufus Nelson continues to find individuals who are willing to learn, play and exhibit our game in the most dignified, gentlemanly and lady-like manner. During the off-season, Manager Ernst will continue to reach new venues and groups to play. The Quicksteps wish to be both competitive and provide education. Players will be able to look forward to the annual survey, end of year newsletter, and off-season newsletters in the months to come. Announcement of the Quicksteps “Hot Stove League Meeting” will be arriving soon. Look forward to a couple new and fun off-season events, as well. Lastly, the date for the midwinter practice session, which has affectionately become known as “Bubble Ball” has been set. The date and time is Sunday, April 2nd, 2017. 1-4pm. I will be sending out a request for your interest in the near future. First, the image on the top of this page is from the 2016 Pipestone Civil War Days event. The Quicksteps thank them for allowing us to use the image. I have gotten a bit behind with updates. Life is sometimes like that. My apologies. The Quicksteps have already had two events with a great new event to come! Again, the Quicksteps were involved in the Scott/Carver Thresher Event, near Jordan. It is always a great time to play 1860 Rule Base Ball! A good crowd watched The Quicksteps, Mankato Baltics and the Arlington Greys, again, compete on a wonderful field on the grounds of the Thresher Association event. Next, The Quicksteps traveled to Pipestone to take part in the Pipestone Civil War Days event. This year three teams took to the field. The Quicksteps, The Westerns of Topeka, Kansas and The Henderson Brothers, a Minnesota Based Fife and Drum Corp, who have come to truely enjoy 1860 Rules Base Ball, but do not consider themselves an active team. Next, on August 27, the Quicksteps will be at the Richfield History Center, 6901 Lyndale Ave S, Richfield, MN 55423. For that event, I am going to be doing an educational talk/demonstration starting at 1 pm. I haven’t decided what all I will cover. At 2 pm, there will be a Ladies Quicksteps match against whoever we can get to show up. Ray Hanson is helping to get enough ladies to form two teams. If you are interested, let myself know by using the email contact post below, Rosie Dotson through the Ladies Quickstep Facebook page, or Ray Hanson. He can also be found on Facebook and goes by the nickname “Stasche”. At 3 pm, The Quicksteps will take on a local team from the Richfield United Methodist Church. Come out and cheer on your favorite group(s)!!! July sees the Quicksteps play 3 events. The Quicksteps will become the “Eagle Creek Quicksteps” as we play on the 4th of July, Independence Day, at The Landing near Shakopee. Play will commence at 11:30 am. Players will participate in the annual Independence Day Parade in Eagle Creek. After the parade, speeches will be made, and players will return to the field of play for a typical 19th century lunch. The second match is a match added to the original schedule. The Quicksteps will take on our ancient rivals, The St. Croix of Stillwater at 3:00 pm in Osceola, Wisconsin before a “wood bat” league game. The Address is on 7th Ave. and Summit Street, Osceola, Wisc. Located at Oakey Park, home of the Osceola Braves. A woman’s match is being planned for noon. The teams involved will be The Lady Quicksteps and a team from Afton. Depending on weather, we will have three pre-season practices this Spring. Check back here if the weather looks threatening to see announcement regarding practice being held. Manager Ernst will also send out an email regarding any cancellations. April 23, 2:00 to 3:30 (approximate) Keyes Park, Columbia Heights, MN 1345 1/2 Street. May 1, 2:00 to 3:30 (approximate) The Landing, Shakopee. Meet in the East Parking lot near the visitor center. We will proceed to the field. Please be on time, we will go as a group and I will have to lock the gates behind us. The third practice date is now pending. The original date of May 15 is the day after our first event, and May 8 is Mother’s Day. Thus, we will proceed as is prudent, and the members see fit. 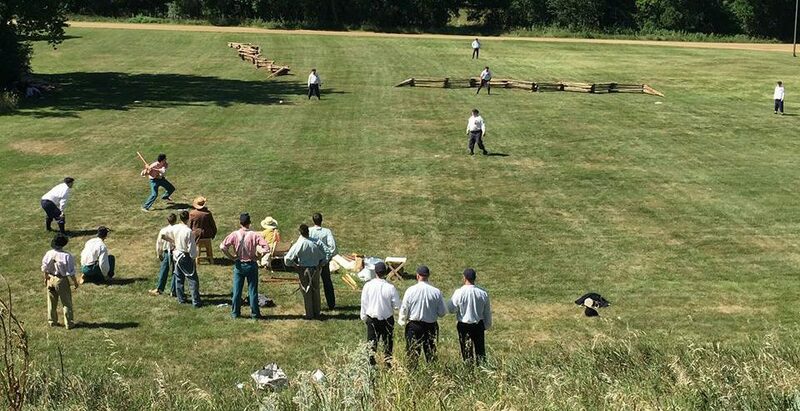 This begins the 22st year of play for the Quicksteps Vintage Base Ball Club of Minnesota. The Quicksteps have two teams, at present. The Men’s Club 9 will play a schedule of matches against other competitive teams, and demonstration matches. The Women’s Club 9 was new in 2015, and will play at several festivals against other women’s clubs. Several of the women currently also play with the men’s club 9, with a great deal of success. Check out the Photo page of this site. Check out our schedule of play and consider contacting the Manager if you have an interest in becoming a Quickstep. For further information, you can check out http://www.vbba.org – which the Quicksteps are full members.